1. Heat Oven to 180°C. 2. 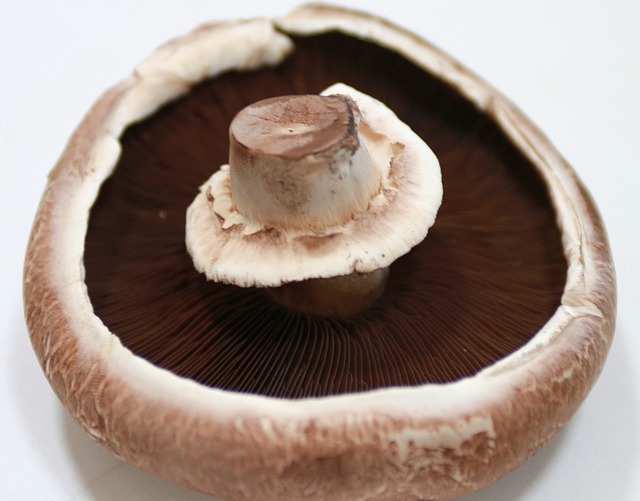 Remove stems and gills from mushrooms and place on a lightly greased baking sheet. Brush with a little olive oil. 3. In a frying pan, heat a little olive oil and cook the garlic and courgette for about 3 minutes. Add the spinach and stir through for one minute until wilted. Divide mixture between the mushrooms. 4. Sprinkle the mushrooms with the breadcrumbs and top each with the chopped tomatoes and peppers. 5. To make the sauce, melt butter in a small saucepan, stir in the flour and cook briefly for about 30 seconds. Slowly pour in the milk, stirring constantly, until you have a smooth sauce – 1-2 minutes. Remove from the heat and stir in the goat’s cheese. 6. Spoon the sauce over the mushrooms and bake for 15 minutes. Sprinkle with the thyme and serve. Make these tasty stuffed mushrooms when you have the time, and simply pop in the oven when needed. They go very nicely with a round of wholemeal toast. Mushrooms are a good source of calcium and are one of a very small number of dietary sources of vitamin D – both essential for bone health. Mushrooms have been shown in numerous studies to help with overall mortality, weight management, increased energy, heart disease, diabetes and a healthier looking hair and skin. Mushrooms contain a range of important properties, such as vitamin D, calcium, selenium (important for the immune system and liver enzyme function), fibre, vitamin C and potassium. Looking purely at the calcium contained in mushrooms, we know that this plays a very important role in strengthening teeth and bones, but also it can help with PMS and weight management.